I have to say, if you're going to make a clone, do it like this. Macky and Pentell is, in fact, a clone, but not of anything as well known as Mario or Sonic. Most people haven't played the original game, compared to those other classics, so this shooter feels original in every way. Colorful backgrounds scroll by under diverse numbers of cartoony baddies while you zoom around the screen shooting. Life is full of surprises. Things in Macky and Pentell just work. Collisions are adjusted to fit each sprite just how you'd expect it, and everything torpedoes smoothly around your screen, animating with every movement and flourish. Enemy numbers are always balanced nicely onscreen, blocking your path to the drifting powerups and pummeling you with an arsenal of crazy comical weapons. Menus animate and function smoothly and efficiently, creating the crisp, fluid sense you can feel in any well polished game. Brilliant showers of lively color bounce continuously around your screen and create one of the most dazzling game maker games I've played. The scrolling backgrounds behind your playing area add immense painting-quality detail to the screen, as waves and waves of diverse enemies of all shapes and sizes do their best to obstruct your path with glittering graphical effects, and die with cartoony liveliness. Even the level select map tempts you to take your hands off the keyboard and lean back and examine its beauty. Unfortunately, there's a catch to all this splendor that won't affect your time enjoying the game, but might change your attitude about its perfect graphics-- again, it is a clone, and its graphics aren't original. Whether they are or not, you'll remember this game just from its wonderful appearance. Upon your first time playing this, you'll admire the sound effect use, although chances are it won't stand out as something amazing and unforgettable like the sound in LockOn. However, the sounds in Macky and Pentell are brilliantly used, in their timing, choice, and editing. The reason they might leave a mediocre first impression is that the game doesn't start with any music for you to listen to. The game will accept music you put in its folder under a certain filename, so after the first time you'll hear how awesome it sounds when the sfx are played over your chosen mp3 audio. If music came with the game, considering the number of stages it has, the game would be unbearably humongous. Most people new to this game immediately complain that it is amazingly way too hard. However, you learn quickly, and will find yourself playing for the better part of an hour just trying to beat your scores. The game just doesn't get boring. Its stunningness never wears out. 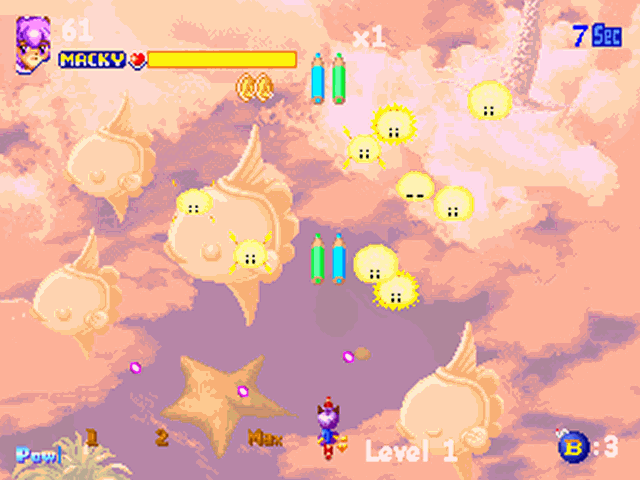 If a stage grows bland, you can move to any one of the other 8 stages to play instead, with a completely different set of enemies, music, and graphics. After my first session of this shooter, I labeled it among the best GM shooters I had played to date, and decided to keep it. Best of all, the source code is available here, so, if you're a programmer, you can mess around with its features further and let it never grow old. Recommendations: The 9 people who like Macky and Pentell also like the following games. 10 points for graphics, although I didn't see any MP3 files with the game... Anyway, there didn't seem to be any point to the game other than rack up points. I think that was the point, but it was still a little dull. Even so, it was pretty good. I have some questions. Can you play as Pentell? If not then what does she have to do with the game? How do you get the fourth weapon, the one that flashes and is white? What happens when you level up? I'm downloading this right now just because it looks like it. Mocha Man said everything, except I give it an 9.6. That is HIGHER than my LockOn,Jumper Series and Mini Golf Pro rating. I dont miss the music much; the sounds fill up the space. The game is awesome, and I think I'm going to be hooked on it for awhile. The game is quite challenging, but not up to the point of being annoying. Where did you get the grahics? I actually own the real game, and I have to say...this clone stays true to the original in just about every way. A great download if you have some spare time to burn.